The Tumi Awards are given once a year in the state of Florida during the month of September. The Tumi Awards are given to the most notables Peruvians in the United States. It is considered the “Hall of Fame of the Peruvian Community” and took place on Saturday, Sept. 21 at the Colony Theatre, located at 1040 Lincoln Road, Miami Beach, Fl. 33139. 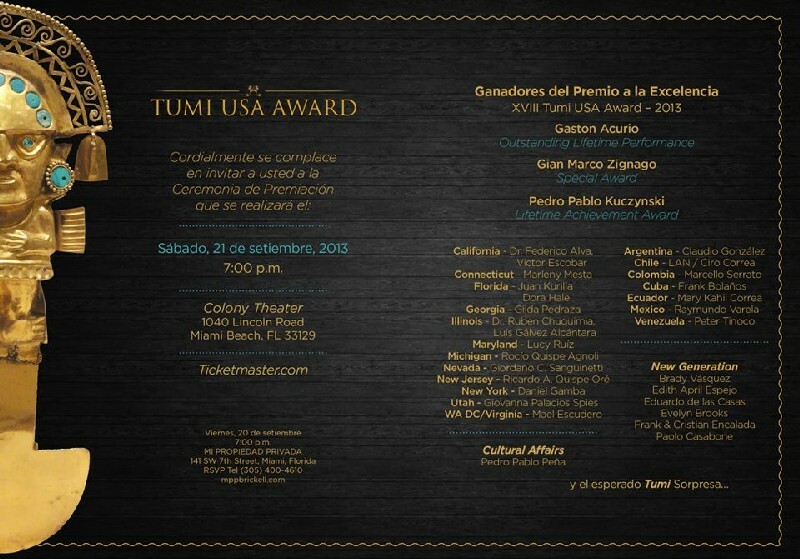 The XVIII Tumi USA Award ceremony honored 33 winners with the Award of Excellence, 26 of whom are from Peru and seven are from Latin America. The award winners receive this honor of recognition, gratitude and admiration for excelling as professionals and students, as well as exemplifying outstanding merit, venerable trajectory and contributing toward society’s collective development and welfare. This recognition acknowledged in the U.S. cities where the prize winners are from, as well as Peru. Entrepreneur New Generation was the award that I was chosen to receive. To be honest, I don´t ever work expecting to get a recognition nor an award. I work endless hours taking care of designing, creating, producing along with my team my jewelry designs. I am passionate about what I do, it runs in my veins. I grew up seeing my father working 80% of his time and my mother always by side. All they wanted was to provide the best education as we grew up. Through my jewelry designs I want to tell the world about the beauty of something so traditional as the Peruvian huayruros. I like to keep the tradition of wearing Peruvian huayruros but wear them in a more modern and fashionable way. My husband and I launched Evelyn Brooks Designs in 2004. We did it with two goals in mind. The first one, design pieces inspired by my Peruvian culture but with modern designs following the latest trends and also have as part of our mission to help communities in need through different socially responsible programs. We have partnered with different non-profits to help them raise my needed funds. Evelyn Brooks Designs has been in business for almost 10 years. We have been able to bring my jewelry designs to over 80 boutiques, galleries and museums in the United States. Evelyn Brooks teaches ¨Jewelry: A creative and lucrative experience¨ at the only Spanish program given by the Montgomery College. I have also been invited by the Peruvian government agency PromPeru to speak about my jewelry experience entering the U.S. market among other important subjects related to the jewelry industry. She has become in a short period of time an expert in the entrepreneur world of the jewelry industry in the United States. Let me tell you a bit more about my Peruvian Huayruros; they can also be found in other countries in Latin America as well as Africa, India and Europe. Many of us(Peruvians) wouldn´t wear the huayruros traditionally like our indigenes from the tribes of Pucallpa, but I am pretty sure you would were them in a more modern presentation, right? I feel SO proud when I see the most important museums in the United States interested in my jewelry line. Like the Natural History Museum of Harvard, The Museum of Art and Design in New York, the Baltimore Museum of Art, and the Women Museum for the Arts in Washington DC among others are interested in the design, the story and the message behind my Peruvian huayruros. I will be eternally thankful to those who believed in me, in my designs and to those who wear proudly my jewelry designs made with Peruvian huayruros, something so traditional but with a more modern and fashionable flair. I like to thank the different press and media who are always supporting my efforts. The different organizations like Empowered Women International, the DC Fashion Foundation, The National Hispana Leadership Institute, Latinas Leading Network, Latina Mom Bloggers, Mami Verse, Latina Bloggers Connect, Dialogue on Diversity, Montgomery College, among others. And most importantly to the Embassy of Peru in Washington DC, through their cultural attaché Mrs.Flor Dìaz. I thank my friends and family who were able to be with me in this special night. Specially my friend Erika Miniza whom I haven´t seen in 20 years and whom drove from Atlanta to be with me. THANK YOU! I´d like to finish this blog post dedicating this award to all those business entrepreneurs who work hard to be the best in what they do but whom also have the difficult job of being a parent that are always looking to give the best example to our kids. We are seeing red for Fall 2013 fashion trends!